So far, it's been a pretty surprising mushrooming season! Back in early September, we were unqualified in our optimism about the upcoming mushroom crop. We naively declared, "It's a promising start to what could be a particularly good mushrooming season" on the southern Oregon coast. We may have spoken too soon. We were gone most of September on an 1,800 mile drive around the United Kingdom, making a grand tour of Scotland (including the amazing Isle of Skye), Wales and England. We visited small towns and large cities, pubs, distilleries, museums, parks and other points of interest. Driving on the "wrong" side of the road while seated on the "wrong" side of the car took a bit of getting used to, but we managed it without mishap, and saw people and places we'd never have seen any other way. Everywhere we went, we were met with kindness and a welcoming attitude, and we were a little surprised to realize that to many of the people we met, our American accents were as interesting and charming as their lovely accents are to us. We do hope that international visitors that come here to the U.S. are treated as well as we were. We usually stayed at B&B's, feasting every morning on Scottish, Welsh and English breakfasts; the primary difference between these was what country we were in, as the breakfasts were essentially similar. One exception to this was Scotland's frequent inclusion of haggis (the always useful Wikipedia defines haggis as "a savoury pudding containing heep's pluck (heart, liver and lungs); minced with onion, oatmeal, suet, spices, and salt, mixed with stock, and traditionally encased in the animal's stomach and simmered for approximately three hours"), and black pudding (which Wikipedia defines as "a type of sausage made by cooking blood or dried blood with a filler until it is thick enough to congeal when cooled"). These latter two items are, we reckon, an acquired taste; we did try them, but found them not to our liking. One other interesting breakfast item that we encountered almost everywhere was canned "pork and beans;" while we like them, we've never thought of them as breakfast. Steven became quite fond of sauteed mushrooms on his breakfast plate, however, even though they appeared to be the usual, mundane white button mushroom. A walk down the vegetable section of several grocery stores in the outlying areas revealed little but these button mushrooms. 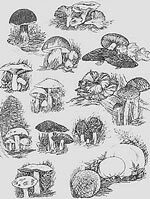 When asked about mushrooms, most people simply answered that they came from Ireland. 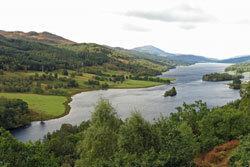 Just one of many lovely Scottish vistas.